Who would have guessed that less than a year after Motorola gave us the Moto X, that we would have a whole family of “Moto” branded phones to compare. I sure didn’t picture it, yet that is exactly what we have. Thanks to last night’s unveiling of the Moto E, we now have three devices in total under the “Moto” name, the third being the previously announced Moto G. A fourth – the Moto 360 – will be here shortly. 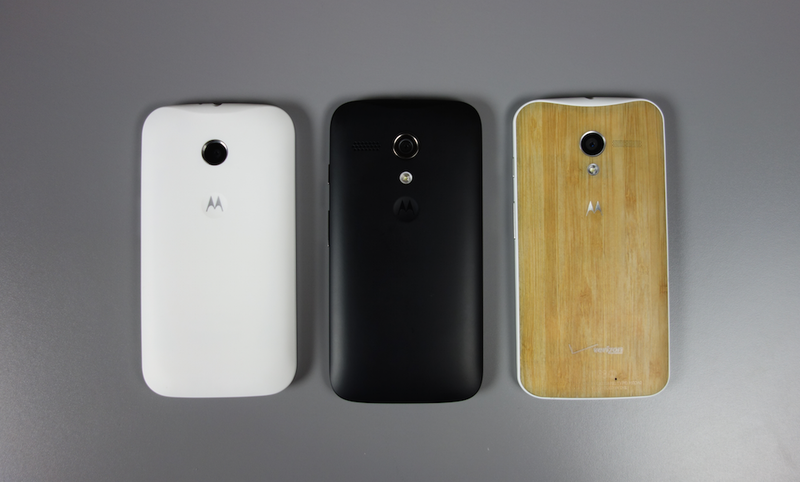 Since we have three Moto devices, we decided to take a moment to compare them on camera. The differences here are subtle in some areas, then drastic in others. The Moto X, for example, has flagship features like Active Display and Touchless control, along with customizable options through MotoMaker. The Moto G and Moto E, on the other hand, have minimal software add-ons from Motorola and only swappable shells for customization. The specs also differ here and there (Moto E specs, Moto G specs, Moto X specs). The Moto X tops the list, as you would expect, even with its older processor. The Moto G and Moto E are actually quite comparable, minus a flash and front facing camera. In the video below, we’ll talk about all of these differences, including price.